We are excited to share with you a preview of our latest project — Morphocode Explorer! Morphocode Explorer is an interactive web tool that combines various data sources and provides a single, powerful, easy to use interface for exploring the city. 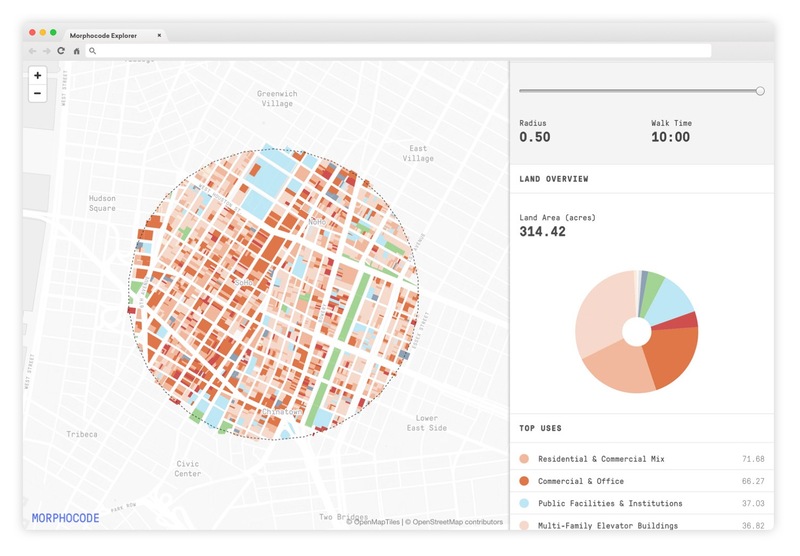 It allows you to select a specific urban area and explore various urban metrics such as access to transit, land use, built density and demographics. 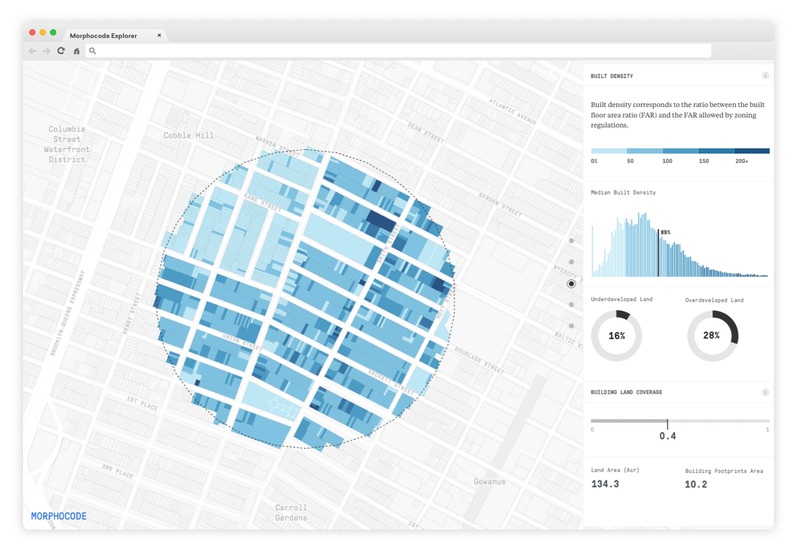 Whether you are conducting an urban study, analyzing the market, measuring walkability or evaluating the business potential of a specific area, Morphocode Explorer can help you build a data profile of the selected location. 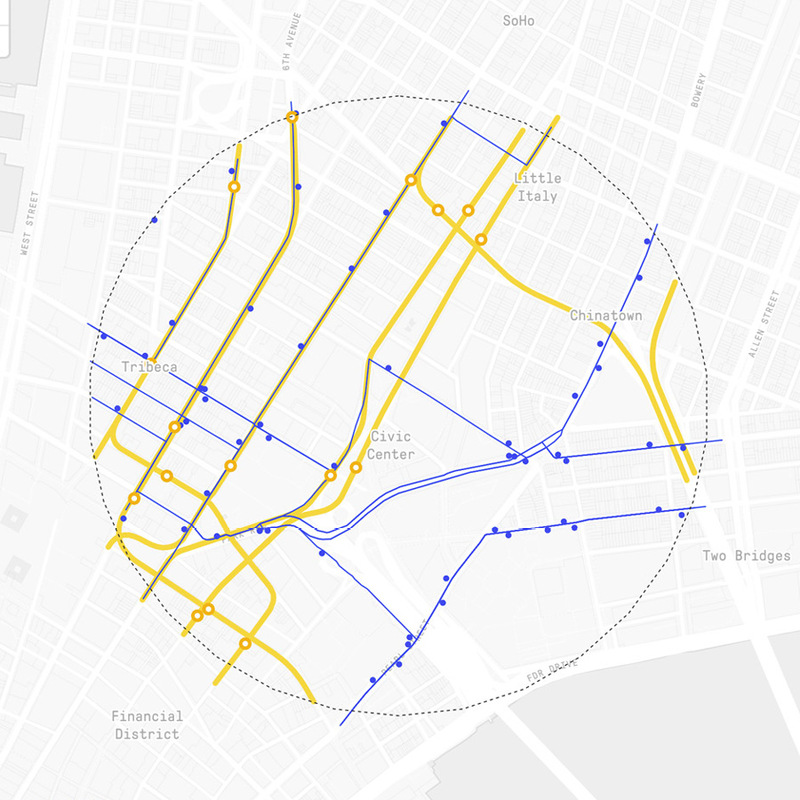 The web tool offers an ultra fast, intuitive way to explore the city directly in your browser. This is made possible by combining some of the latest web technologies with a custom data processing pipeline. The interface provides an interactive map and a sidebar displaying contextual information about the selected area. Presenting large amounts of data in a single view is a challenging task. There is a risk of bloating the interface with too many options and ultimately overwhelming the user with various checkboxes, toggles and drop-downs. Since the early design sketches, we wanted to keep the interface minimal while still giving access to various metrics. 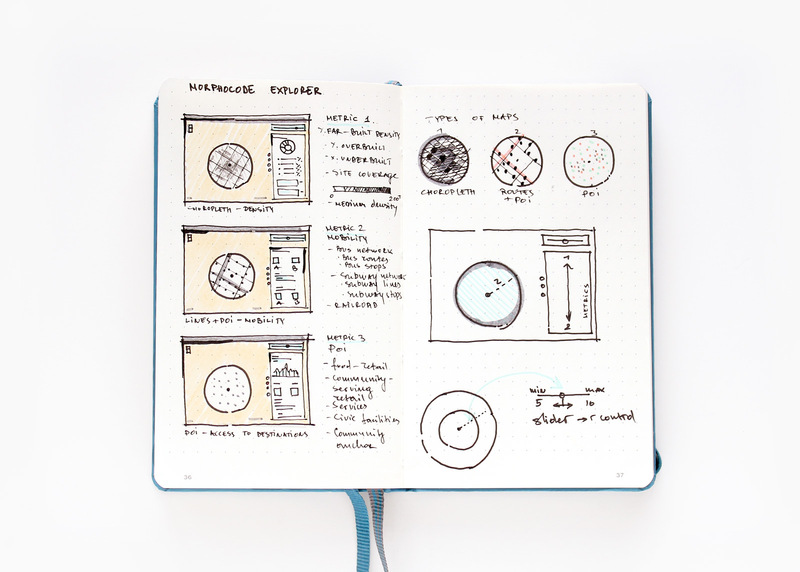 We envisioned a simple interaction that makes data exploration playful yet powerful. 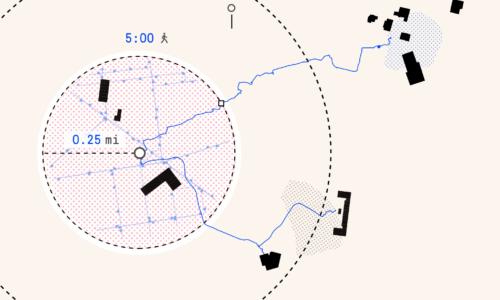 The Brush component is the primary way of interacting with the map. 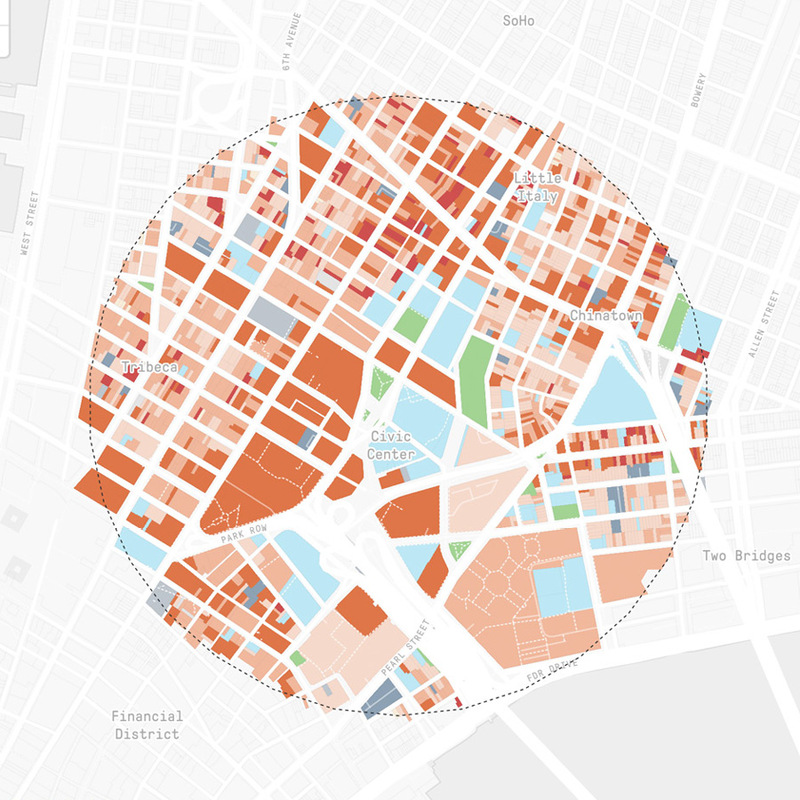 You can drag it to change the location and focus on a specific area of interest while the related urban metrics are updated in real time based on your selection. The circular brush represents a pedestrian shed with a radius ranging from 0.25 to 0.5 miles – the distance most people are willing to walk to reach a destination. This is roughly equivalent to a walk of about five to ten minutes. By default, the brush radius is set to a quarter of a mile, but you can use the slider to adjust the size of the area and explore different walking distances. 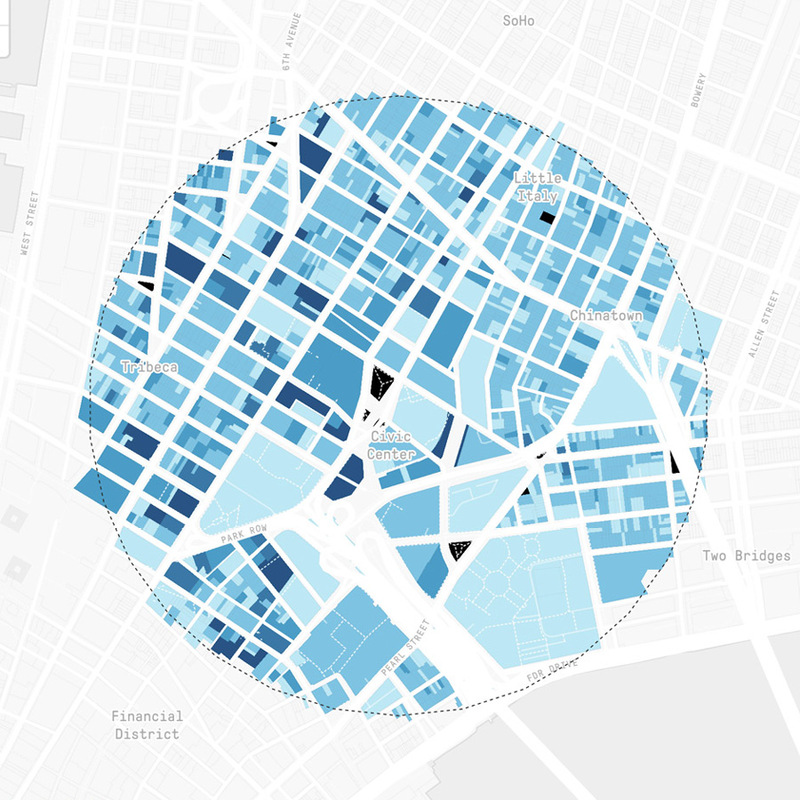 The brush component provides an easy and intuitive way to explore urban data. You can conduct analysis and compose location profiles at a glance by changing its position and size. The 5-10 min walk is the most common scale for walking activities in an urban environment. Especially when it comes to reaching transit or running daily and weekly errands. We tend to choose the shortest, safest and most pleasant routes for these recurring journeys. People usually meet their daily needs such as grocery shopping, local recreational activities and access to transit service within walking distances. Since most of us are willing to walk for about 5 to 10 minutes to reach those services, the land area of a typical walkable neighborhood is around 125 to 500 acres. Although there is no single definition of the term neighborhood, it usually involves a pedestrian shed of a quarter to half a mile distance placed around a common destination such as a school or around a local center where amenities cluster. This scale is large enough for evaluating the impact of adopted policies and capital projects, yet small enough to accommodate the notion of place and proximity. At the neighborhood level, common liveability measures such as land use mix, population density, and street design start affecting the quality of life of residents. Morphocode Explorer is still under development, but we plan to release a beta version for New York City in the upcoming weeks. You can subscribe in the form below to get notified when the tool becomes available.